Trust the advice of an expert. 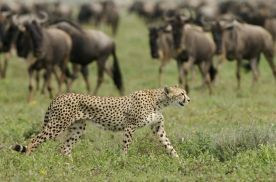 Founded in 2005, Safari Online takes all the guesswork out of deciding which destinations to visit and how to put it all together. Our tried-&-tested itineraries use accommodation we visit regularly to ensure it’s as good as we say it is. And if you’d prefer something more personalised, then tailor-making an itinerary based on your needs and budget is what we do. Go on safari and you can look forward to game drives, river cruises and motorboat safaris; more adventurous itineraries include multi-day canoeing and walking safaris. 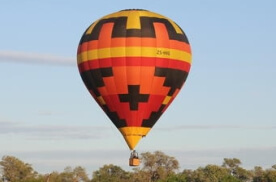 Bird-watching, hot-air ballooning, cultural tours and spot-lit night drives add to the experience. Then there are Africa’s more unusual wildlife encounters: game viewing by elephant-back, walking with friendly lion cubs, and jungle trekking for gorillas and chimpanzees. 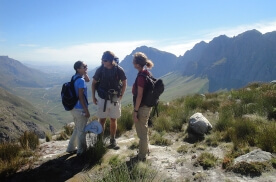 Hiking trails criss-cross the peninsula and include the most iconic destinations: Table Mountain of course, but also Lion’s Head, Cape Point and – beyond Cape Town – the Cape Winelands and Whale Route. Different kinds of hikes too: half-day and full-day hiking; easy, moderate or challenging hikes; and walks focussed on wildlife or bird watching. 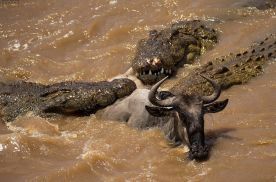 If you’re planning to travel to Africa in 2019, then it pays to know what happens where and when. A continent of dazzling diversity, Africa is a destination where each month delivers something special; the trick is to match your month of travel with the best experience at that time. 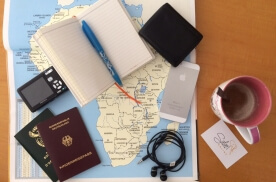 Use our African Travel Calendar – a month by month guide. The Livingstone Island tour is offered 5 times on a daily basis. A twin-engine boat will take you on a thrilling journey through the fast-moving channels of the Zambezi River. On the island you will be given a guided tour, learning about its history from ancient times when it served as a sacrificial site to the present day and its World Heritage status. Providing a unique river-based experience, a Botswana houseboat safari is ideal for discerning safari travellers and those in search of a more intimate and unusual approach to a safari. Usually a chef, guide and housekeeper ensure guests want for nothing, and the focus in on a personalised stay. 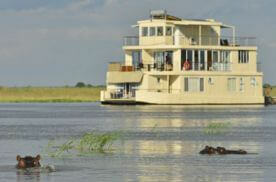 Guests aboard a Botswana Houseboat can look forward to plenty of rest and relaxation. 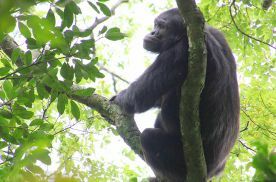 Mahale Chimp Trekking in Tanzania is a lifetime experience. The Mahale Mountains which are home to the world’s largest known population of chimpanzees, with approximately 1000 individuals inhabiting the national park. Once you’ve found the Mahale Chimps you’ll have 1 hour to hang out with them and watch as they play, groom and forage on the floor around you. 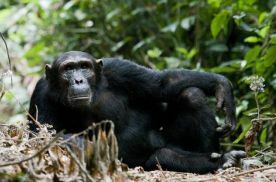 The group of 16 Rubondo Island chimpanzees who were originally rescued and introduced onto the island were raised in European zoos. Many of the safari guests wonder how the chimps arrived on the island in the first place. We have been to Africa for 24 of the last 27 years so know a bit about what is involved. Walter has arranged the details for the last couple of years, and has done a superb job. He is always quick to respond and comes up with answers immediately……..no evasive tactics, always head-on! Safari Online were extremely efficient and absolutely charming to work with. 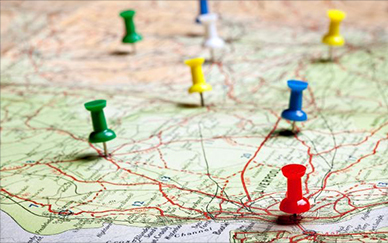 Our 28-day itinerary took us to South Africa, Namibia, Zimbabwe, Zambia and Botswana. A magnificent and unforgettable adventure. Everything ran smoothly and efficiently from the flights, transfers, rides, connections, etc. Absolutely wonderful! Can’t thank them enough! It was a safari of a lifetime and exceeded all of our expectations! Our mom grew up in Central and South Africa so we had visited the continent many times. My sister and I wanted to take our teens and husbands to Africa to experience the magic. We had a limited budget but big and specific expectations and by some miracle Walter was able to manage both. An incredibly well organised tour with no hassles whatsoever. Safari Online understood our needs and was able to present us with sensible options to choose from. 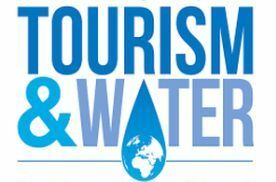 It was evident that this tour operator has knowledgable and experienced agents who can arrange a seemless tour. We were provided with a professional online itinary which was comprehensive and easy to use, knew exactely what to expect, and encountered no stumble blocks along the way. Safari Online made our fantastic family holiday dream come true!! 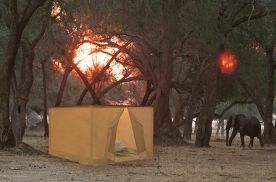 Safari Online have been nothing but professional and incredible from the time we made our first enquiry to the last day of our stunning holiday. Nothing was too much trouble for Walter. We are now starting to plan our next family Safari for 2019. Guess who we will be booking with??? Safari Online we hope you are ready!!!!! Communication was excellent – I asked A LOT of questions and did a ton of research myself and Walter was extremely patient with me and very responsive. he was straight forward and extremely professional. Tour itself was excellent – an incredible experience and one never to be forgotten. Everything was spot on. Excellent service and they supplied good suggestions for our holiday they also organised all internal flights and arranged check in for us so we had no worries while on holiday. We have had a most memorable holiday staying at wonderful places thanks to Sabrina and Safari Online. Would recommend Safari Online to organise your holiday. Best trip I have ever been on. Highly recommend. Would highly recommend. 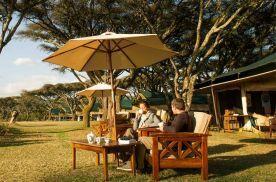 Safari online asked questions when booking and were efficient and knew exactly what we were looking for in terms of accommodation and animals were wanted to see. Gave advice on a few little extras with no pressure, which we did and am very grateful which make trip even more exciting. Would definitely recommend booking with them. Professional, quick and top of the edge service!!! From the very first contact we’re very happy about the respond time and quality of information from safari-online.com. Based on the received first tailor-made quote, which is a weblink with all the details about the flights, photos of the lodges etc. we knew that this is “our” partner for this trip. Our expectations were excelled!!! Our experience with Safari Online was excellent. After becoming very frustrated trying to search for a safari destination on our own, we turned to Karina for help and she was a lifesaver. We had an amazing safari adventure at the lodge–the experience of a lifetime–and are so grateful for her help. We literally couldn’t have done it without her! I agree that my information can be stored and processed.